This is also referred to as Triple Therapy because it contains three drugs in one pill, i.e. 1 Tablet once-a-day. A. Because of the five main side effects of this medication, it is recommended that patients take this medication at night, in order for the side-effects to take place at night and not during the day as indicated in the illustration on the left. B. Do not take this medication together with your food, i.e. 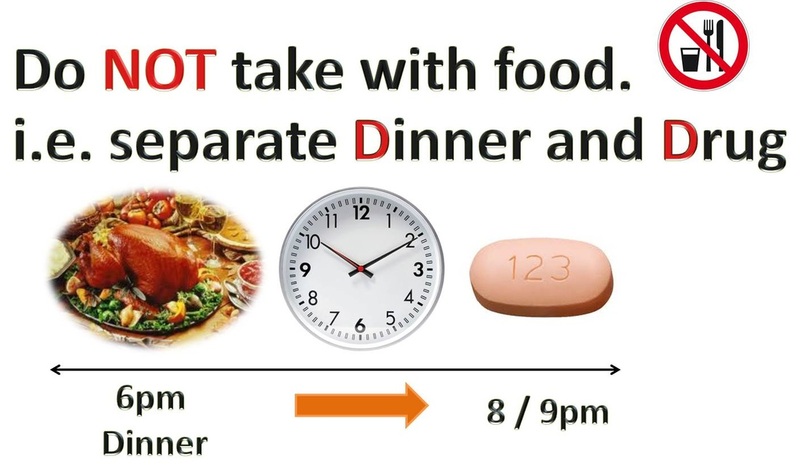 A. have dinner, then wait 2 - 3 hours, then take your tablet. This will lessen the impact of possible side-effects such as nausea and vomiting. This refers to medication that you might take once or twice a day (am / pm or both) depending on your Viral Load, TB Infection or Pregnancy. This type of medication must be taken with a meal high in healthy fats.